So far, we've featured girls with crazy nails, girls that smoke, girls with hot feet, pale girls and even girls with moles—wow, a lot of girls—but for this Fetish Friday, we are gonna take a look at the hottest girls with tattoos. There's something to be said about a girl who's inked. 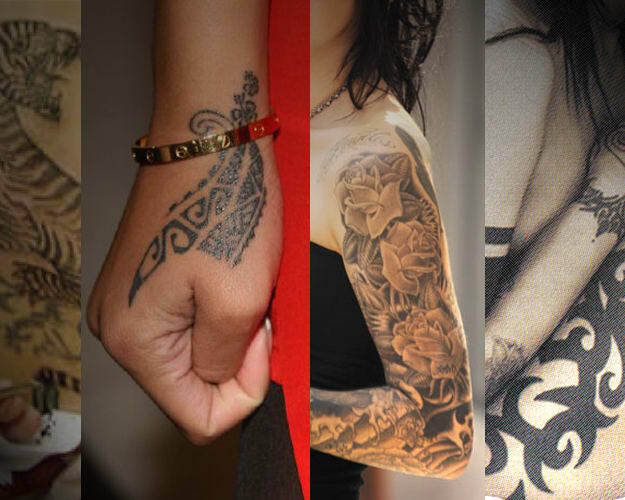 Tats on a chick not only show that she's badass, but also that she has a high tolerance for pain. • Hey, at least she didn&apos;t have "Nasir" permanently etched on her forearm. • Bad girl, bad tattoos. Take that as you will. • This was a given. We don&apos;t think anyone can hear her name without picturing her titt—we mean, tatties. • Her multitude of tattoos are as classy as she is. • She has the tattoos of a rock star, even if she has the chest of an 11-year-old boy. • All that fighting with Chris Breezy got her tough enough to get 11 tattoos. • All her tats look good, except that Billy Bob one--good thing she had it removed. • The sexually liberated vegan girl from Girlfriends has that hot afro-tribal thing going. • The pornstar takes it in (and all over) the back. We&apos;re talking about her ink...or are we? • CLICK HERE TO SEE MORE FETISH FRIDAY POSTS!